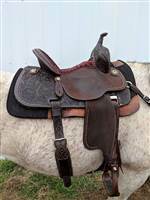 This saddle has the Martin adjustable rigging, 14" seat, 7" gullet, gorgeous maroon suede seat, copper stud accents around the edges of skirt and fenders, flower tooling on the short skirt option, and upgraded chocolate brown Nettles stirrups, and back cinch with hoof pick holder. The forward hanging, turned stirrups and deep seat give an extremely comfortable, close-contact feel with a lot of freedom for movement, but still holds you in around the turn. It's practically brand new- used (maybe 40 rides)-kept inside and taken care of. Will split shipping. Located in Macy, Indiana.